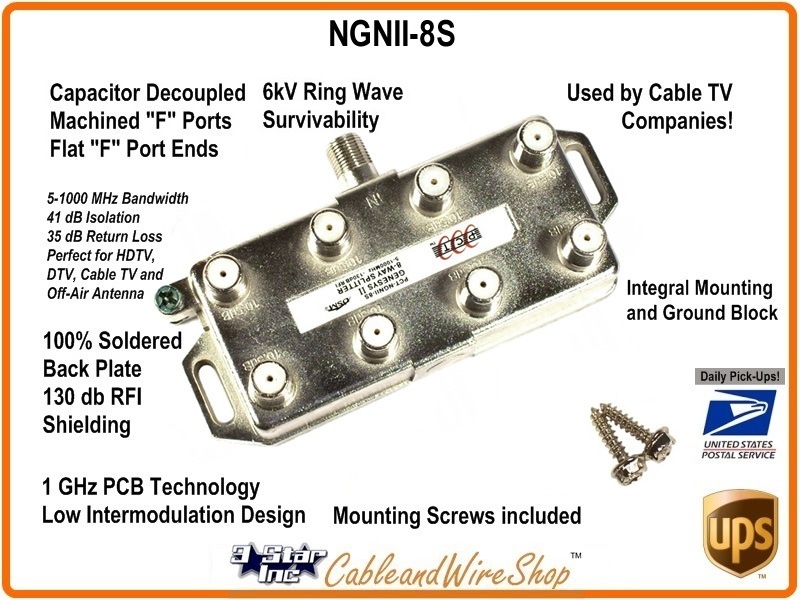 Use the Same 8-Way Splitter Your Cable TV Company uses, like this Genesys II Series 1 GHz 8-Way Indoor / Outdoor CATV Coaxial Drop Cable Splitter That offers exceptional performance and long-term reliability for 2nd TV installations, particularly in systems with cable modem applications. Genesys II Splitter were specifically designed for minimizing intermodulation distortions and spurious signals. Included with the Genesys II Series is PCT's patented Digital Seizure Mechanism (DSM), which provides significant advantages in center conductor retention, surface contact area, and electrical performance with soldeback or tongue-and-groove backplates. They offer Superior intermodulation distorion and second harmonic performance with Excellent return loss and port-to-port isolation in the return band. Patented DSM seizure technology provides increased spring retention for better surface contact (patent #6450836) u Gold-plated, beryllium copper construction for better corrosion resistance, impedance matching, and prevention of common path distortion. They can withstand a 6 kV surge, guaranteed second order harmonics performance after 5 surges to each port of 6kV (per IEEE.C62.41.1991 Category A3). Tin-plated backplate provides minimum -130 dB shielding effectiveness and superior defense against long-term corrosion factors. Expect -60 dBmV spurious signals and 2nd harmonics with a +55 dBmV input carrier. Weathesealed F ports are Machine threaded and Flat. Note: This is one of the same 8-Way Splitter that Comcast uses. Its Plated Housing is Soldered Closed and Sealed from the Environment, as well as Transient and Spike Voltage Resistant. The Finish is designed to Resist Corrosion due to Weather. It will pass 1 GigaHertz worth of Forward and Return signals; making it perfect for Splitting Cable TV with High-Speed Internet and Pay per View DVR Box Connection Signals. The Voltage Protection also makes it suitable for splitting HD TV Antenna Signals as well. The Flat F Connector ends means that the connection to the RG coaxial cable you use (RG6 or RG11) is solid, secure and doesn't slip or back off after tightened with appropriate force (most Coaxial Cable Manufacturers specify in inch/pounds). When making RG6 or RG11 cable connections outside, a weather boot covering and some sort of Silicone compound are highly recommended.